Font design, aka Typography, is the art and technique of arranging type to make written language legible, readable, and appealing when displayed. When Steve Jobs was creating the first Mac, he did something that was never done before. He created 10 font designs that you can choose from. He was so obsessed with crafting the perfect font design for the Mac because he knew how typography can significantly improve user experience. Font design involves selecting typefaces, point sizes, line lengths, line-spacing (leading), and (tracking), and adjusting the space between pairs of letters (aka kerning). The term typography is also applied to the style, arrangement, and appearance of the letters, numbers, and symbols created by the process. Different font styles communicate different subconscious messages to people – which can help you build brand identity. Believe it or not, specific font styles can convey different messages such as trust, stability, strength, elegance / sophistication, creativity, etc to people. Imagine if you want to build a website for your accounting or legal business, what type of font design do you think you should use? Would you use the same font style if you’re building a wedding photography business website? Probably not. It can help you grow your business. Using the right font design with the right layout design can make your readers feel more comfortable, increasing the chances that they will read more of your content material. This helps you build trust with your visitors (as they consume more content) and therefore gives you a better chance of growing your business. Let’s face it, your business will not grow online if your visitors don’t feel comfortable with reading your material on your webpages. Julieta Ulanovsky created this font, for she lives and works in Montserrat, Buenos Aires and wanted to preserve the beautiful typography she saw on the street there. This font is distributed under an open source license and goes some way toward preserving the urban typography of the historic region. Lato is created by Polish designer Łukasz Dziedzic and published under the open-source Open Font License. Originally developed for a client project, which was later steered in a different direction, the face is relatively non-descript when used small, but reveals its character at larger sizes, where its semi-rounded characters add warmth. 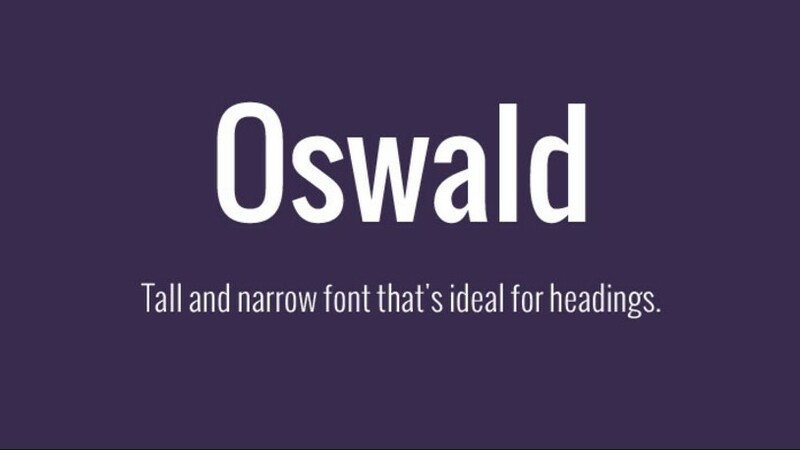 Oswald has been updated more recently to include multiple weights, extended character sets and better kerning. The font is a reworking of the classic Alternate Gothic sans-serif typeface style, created by designer Vernon Adams, and is a fantastic display font for headlines and captions. Roboto has a dual nature. It has a mechanical skeleton and the forms are largely geometric, while its features friendly and open curves. While some grotesques distort their letterforms to force a rigid rhythm, Roboto doesn’t compromise, allowing letters to be settled into their natural width. This makes for a more natural reading rhythm more commonly found in humanist and serif types. Designed by Steve Matteson, this humanist sans serif boasts great legibility even at small sizes, and has been optimized for both web and mobile interfaces. This free web font has an upright feel, with open letterforms and a neutral-yet-friendly appearance that ensures versatility. You can find more fonts on Google Fonts. Typography is one of the details that could potentially have a major impact on your website and business branding.So take your time and go through the font design on your existing website and chose the right one for it. Acknowledgment:This article concludes information gathered from the Internet.